I’m reading, thanks to some friends of Sewanee Creek, an insightful book that chronicles the creation of the United States. 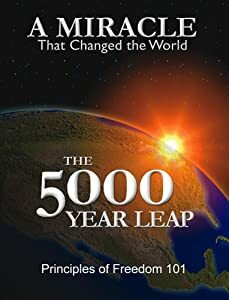 It is called The 5000 Year Leap. by Cleon Skousen. There have been many aha moments, but I just read the opening lines to the 7th principle of freedom: the proper role of Government. It resonated so strongly with me that I felt compelled to jump on the computer and share it. My experience in business management taught me that this is a true principle. In many ways I have always been a bit of a contrarian, preferring to march to the beat of my own drum and driven by strongly held, biblical principles of right and wrong. Often, in the course of my employment, I found that my principles were at odds with those in higher authority. On a couple of occasions I tried to institute change from a grass roots level. That approach invariably landed me in hot water and confirmed to me that this is a true principle. In a corporation, those who have position power will have their way, that is as long as they are clever enough to exercise and maintain power, as they usually are upon reaching a high or ownership position. That understanding emanates from business experience, which can/should be very different from government of a democratic republic. But the underlying principle is eternal and immutable. You can not delegate power that you do not have. In the domain of government, where in America our underlying assumption is of a government for and by the people, the application can become circular and confusing until one inserts the concept of God-given, unalienable rights. These rights and the power that proceeds from them are few and broad, but must be tightly defined. To return to my business analogy, as a mid-level manager, I had neither the right nor the power to institute change within an organization that I did not own or been delegated rights and powers, regardless of my sense of right and wrong. As stated elsewhere in this great book, rights stem from ownership. Where I disagreed with my superiors my options were, (a) execute exactly as I was directed, (b) convince those in authority of a better way or (c) resign and find a place to work more closely aligned with my values. Only when rights of ownership and true authority are respected can an organization of any sort reach the potential to achieve the purpose for which it was created. If it is true that the rights of government of the USA are vested only in the people, it is clear that there has been a boardroom coupe. America is ruled by unelected bureaucrats who report indirectly to hands-off elected officials who have made themselves unaccountable to those who should be vested with power, the people. But the people have become deservedly dis-empowered because of their witless incompetence in the exercise of their power. Anyone who has participated in boardroom politics will recognize that only those who exercise their power with wisdom and clever insight will retain power. Even owner/founders are routinely deposed by hired managers. The American people have lost power because they have failed to exercise their true, God-given power. God giveth and the government taketh away. America is no longer a Republic. It is a corporation, ruled by hired managers. I want to relate this back to something more local, as that is all I feel empowered to speak of with any confidence any more. The Village values individual freedom and rights. Rights stem from ownership. Ownership should be the result of honest thought, labor and investment. This is why individual (not communal) property ownership is a keystone to successful community whether at the Village or Nation/State level. That is why the Village on Sewanee Creek is different from most “intentional communities” that typically end up in flames because they are often built on a utopian socialist, common-ownership model. It is a little understood fact that the constitution of the United States was not ratified or even drafted till years after the successful conclusion of the revolution. Similarly, I have felt it inappropriate to impose homeowner association bylaws for the Village which should be the product of land owners within the village. George Washington declined the offer to become a king. He was a public servant in the best sense. I desire to do the same. My wife and I own most of the Village property now. But when it is sold, I am a Villager, created equal and with equal rights to other Villagers. For those who might be interested in a model for government of the Village (not to mention the Republic of the USA) read The 5000 Year Leap. This entry was posted in Community, Liberty, Politics, Self-Sufficiency and tagged 5000 Year Leap, Cleon Skousen, Energy Self-Sufficiency, Freedom, George Washington, Government by the people, intentional community, Liberty, Natural and legal rights, Self-Reliance, United States Constitution. Bookmark the permalink.